Hmm, I thought I had already published this post but apparently it’s been waiting for pictures. This is part 3 of my March sewing. I haven’t really talked much about Sure-Fit Designs since I bought the whole kit and kaboodle. About a year ago, I had Sarah Veblen fit the bodice of my blueprint from the Shirt Kit, which I then used to make a sleeveless summer dress. A few weeks ago I finally got around to drafting and fitting the sleeve for it. That done, it was time to test it. I chose a wonderfully soft bamboo French terry from the stash and decided to learn yarn couching in this project. I used a cutaway stabilizer for it because this fabric just wanted to stretch and stretch. But the stabilizer made the fabric too stiff to use for the collar. Undeterred, I looked through my limited stabilizer stash to see if something might work better. I settled on UltraSolvy, using 505 spray to adhere it to the wrong side of the fabric. It worked well enough and washed out beautifully. (The wonderful people at my nearest Bernina store later recommended a wash-away polymesh for next time.) I had a lot of fun with those curving, flowing lines. It wasn’t quite free-motion sewing because I had the feed dogs up but I lowered the presser foot pressure and the UltraSolvy happily slid around with very little effort from my fingers. I wore my Machingers for this – they are thin gloves with rubbery fingertips that provide a good grip on the fabric – it’s a fabulous invention, I tell you. After cutting the collar from the embellished piece of fabric, I decided to make another, smaller one, for the sleeve bands. I’m glad I did. I think having only the collar embellished would be a little weird. With the matching sleeve bands, it looks intentional. I think the sleeves turned out quite nicely, even if the shoulder seams look just a tad too long, probably from the fabric being so stretchy. I’ll test it again in a more stable knit soon. 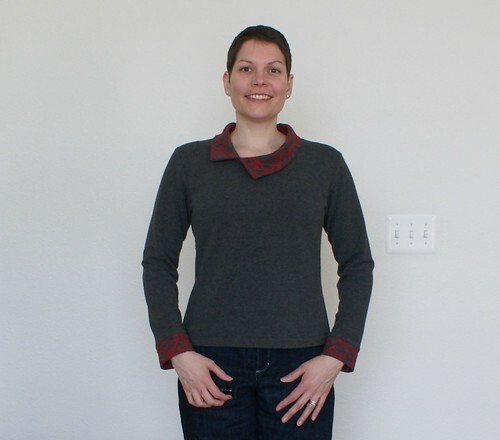 All in all, this is a very comfortable top and I want to make more like it. 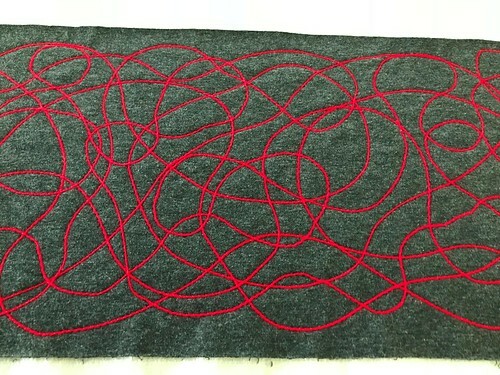 The whole project took 1.5yds even with the extra piece for yarn-couching practice. That is it for March sewing. Next up – catching up on April sewing projects. 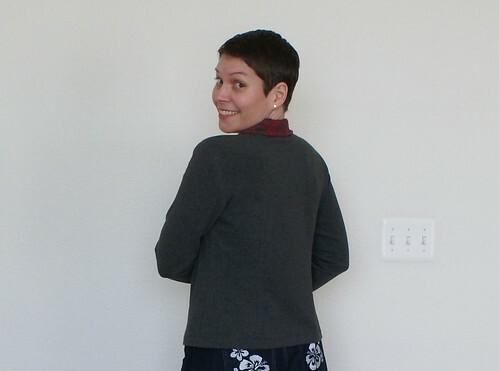 This entry was posted in sewing and tagged Sure-Fit. Bookmark the permalink.